The federal tax cut approved in December and more recent spending legislation could have implications for state and local governments. According to a new Congressional Budget Office report, while both are expected to stimulate the economy, they also will lead to higher federal deficits and debt over the next decade. Consequently, there could be impacts on federal aid to governments here. In December, Congress passed and the President signed an overhaul of federal income taxes, reducing both individual and corporate taxes. That was followed by approval of major appropriations bills that increase federal spending. Combined, the two will impact both individual and federal government finances, and also could affect state and local governments in Wisconsin. Much already has been written about the impact the tax cuts will have on families. In brief, most individual income taxpayers will pay less in federal taxes in 2018 than in 2017. According to the Tax Policy Center, the average cut is about $1,200, but will vary with individual circumstances. The tax bill also reduces corporate income taxes, which will affect individuals in a variety of ways. Among the possible uses of these savings are: higher employee compensation, additional jobs, investments in capital, and stock buybacks. The tax and spending bills are expected to have short-term stimulative effects on the overall economy. 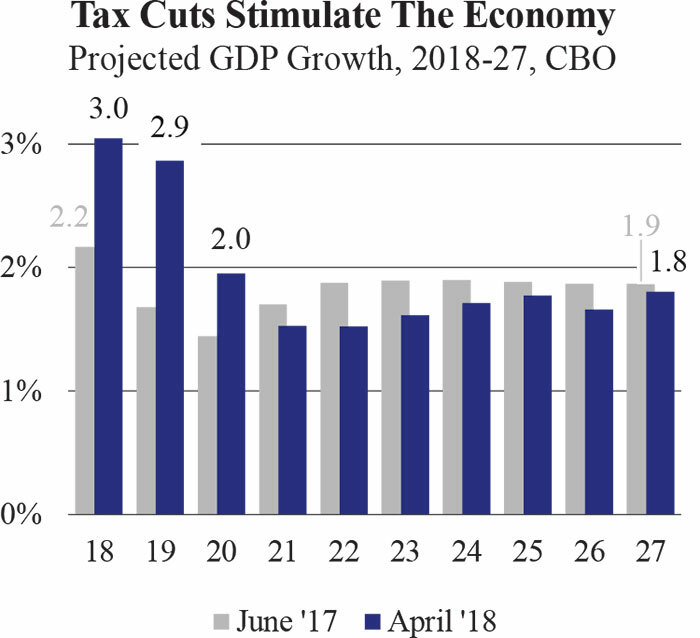 When the federal government cuts taxes without offsetting spending cuts, or increases spending without raising additional revenue, there is a positive short-term impact on gross domestic product (GDP). A new analysis by the Congressional Budget Office (CBO) projects inflation-adjusted GDP to rise 3.0% this year, 2.4% in 2019, and 2.0% in 2020 (see chart). In June of last year, CBO was projecting growth of 2.2%, 1.7%, and 1.4%, respectively, during those years. In subsequent years, GDP growth is expected to be 0.3-0.4 percentage points less than the June 2017 forecast. However, during the entire 2018-27 period, the tax and spending changes would increase inflation-adjusted GDP by 2.1% and employment by 2.6 million jobs. While the federal legislation has some immediate benefits, it also is expected to have long-term adverse fiscal consequences. Among economists, there is disagreement about the magnitude, but that the tax cuts will add to the federal deficit. In its June 2017 forecasts, CBO predicted deficits averaging $1.01 trillion per year during 2018-27. The new report shows them averaging $1.17 trillion annually, a 16% increase. Federal deficits are expected to average 21.8% of spending during 2018-27, up from forecasts of 18.7% of spending in the 2017 report. By 2028, deficits will exceed 15% of spending in 13 consecutive years. Since the end of WWII, the longest run of deficits of that magnitude was six (2008-13), five (1982-86), and four (1990-93), all periods that included recessions. The new CBO forecast assumes no economic downturn. There exist two plausible scenarios in which deficits would be worse. First, recession would reduce tax collections and raise deficits. Second, CBO assumes most of the tax cuts end after 2025, as the law is written. Should Congress opt to extend the lower rates, deficits would be about $650 billion higher than under the baseline projection. In 2028, the federal deficit would be 28.9% of spending, rather than 22.8% under the baseline. Federal deficits are not necessarily problematic when they are small or when total federal debt is manageable. However, the predicted deficits are not small by historic standards, particularly for a non-recessionary period. The question of manageable debt is more difficult to answer because economists are unsure when government debt becomes troublesome. In 2000, $3.4 trillion of federal debt was held by the public, an amount equal to about one-third of GDP. By 2017, that total had risen to $14.7 trillion, or 77% of GDP. The CBO projects that by 2028, federal debt held by the public will nearly double to $28.7 trillion, or 96% of GDP, a percentage that would be the highest since 1946. For state and local governments, the new estimates heighten concerns about federal aid. Mandatory spending (e.g., Social Security, Medicare, and Medicaid) now accounts for 63% of federal spending and is expected to grow an average of 5.5% per year through 2028 (see chart). Interest on federal debt (also mandatory) is now less than 7% of spending, but is expected to reach 13% of spending by 2028. Meanwhile, CBO expects non-defense discretionary expenditures to grow less than 3% per year. Now 15% of total spending, they will account for less than 12% of the total by 2028. Among discretionary programs are federal aids to state and local governments, which help fund highways, workforce programs, the UW System, K-12 schools, among others. The current state budget includes $22 billion of federal money (28% of spending). Federal assistance is already slowing. After increasing 7.8% between 2013-15 and 2015-17, it rose just 1.7% between then and 2017-19. 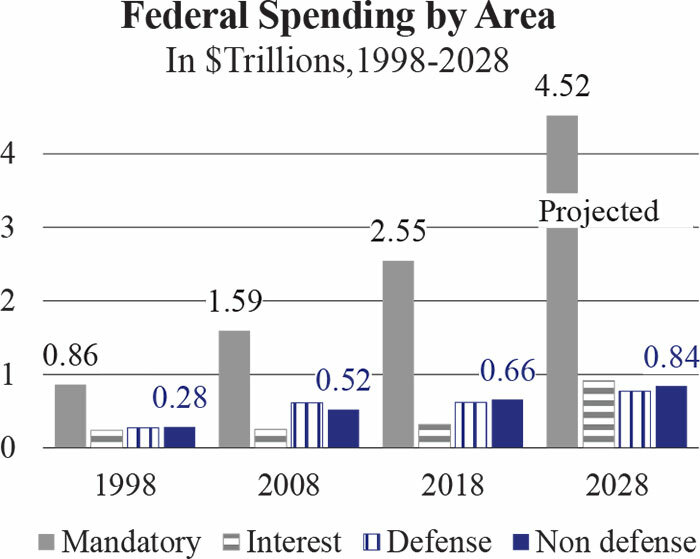 With mandatory spending comprising a greater share of the federal budget, lawmakers will have to prioritize broadly between defense and non-defense, as well as between programs within that latter category. That does not bode well for federal assistance to state and local governments, which may need to be on the chopping block. ◾ The state Department of Justice has begun taking applications for more than $100 million in School Safety Grants, which are available to both public and private K-12 schools. Grants will be awarded in two categories: baseline improvements to schools, such as door locks and hardened school entryways, and advanced grants to schools that have already met minimum security thresholds. Grant applicants will be required to provide teachers and educational staff with training in trauma-informed care and partner with local law enforcement agencies. Funds will be available for the 2018-19 school year. ◾ Two pioneering state of officials died recently. Former Attorney General Peg Lautenschlager, the first woman to serve as Wisconsin’s attorney general, died March 30. Lautenschlager, 62, was AG from 2003 to 2007. She also served as a state representative, local district attorney, and U.S. attorney for the Western District of Wisconsin. Former Secretary of State Vel Phillips, the first African-American to hold statewide of office, died April 16. Phillips, 95, served from 1979 to 1983. She also served on the Milwaukee City Council and as a Milwaukee County Circuit Court judge.